Applications were up this year at Williams College (photo credit: Tim4403224246). The admissions statistics are in the books for the Williams College Class of 2023. In all, between the Early Decision and Regular Decision cycles, over 9,700 students applied to the Williamstown, Massachusetts-based school this year in the hope of earning a slot in its Class of 2023 (compared to 9,559 last year for the Class of 2022). Of this year’s applicants, 1,205 students earned admission (compared to 1,163 last year). Williams’ anticipated class size is 550 students, which is the same target size as for the Williams Class of 2022. 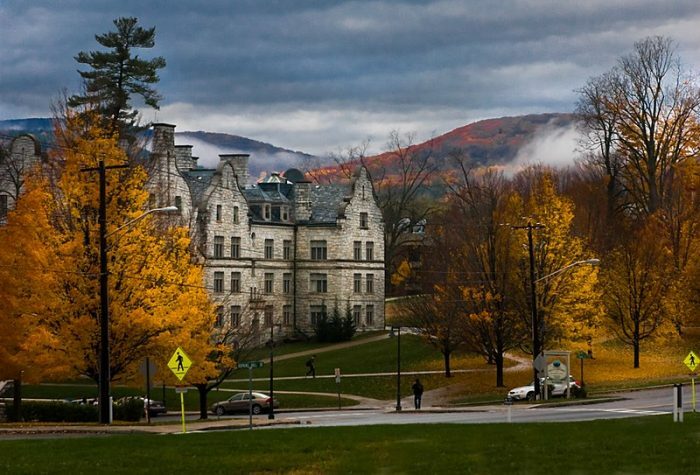 As reports Scott Stafford for The Berkshire Eagle in a piece entitled “Williams applications, admissions up slightly; about 550 expected for Class of 2023,” 515 of the admits to Williams’ incoming class identify as men, 597 as women, three as trans, four as nonbinary, and six as another gender identity. The admits to Williams’ Class of 2023 hail from 52 nations. Of American admits, 58% identify as students of color. 20% will be the first in their families to attend college. 7% are the children of Williams College alumni. Admits hail from 893 high schools around the world. 733 marks the average evidence-based reading and writing score on the SAT for admits, while 749 marks the average for math. Admits’ average super-scored ACT is a 33. Williams College historically ranks at the very top of the annual US News & World Report ranking of “Best Liberal Arts Colleges.” Congratulations to all students who earned admission to Williams College’s Class of 2023! Go Ephs!